There has been a lot interest in the upcoming role of Warner Bros.' Batgirl, with actresses revealing via interviews or social media that they'd like a crack at the role. Lindsay Lohan is the latest and she has taken it one step further by trying to get her message out to director Joss Whedon through her Twitter account. Previously, Hailee Steinfeld expressed interest in the part in an interview, but Lohan is full on campaigning for the role of Batgirl in an aggressive manner, hoping to get the attention of Whedon. Lindsay Lohan took to Twitter over the weekend to say, "RT if I should star in the new Batgirl movie and everyone tell Joss," which was then punctuated it with a kissy face emoji. However, the tweet is vague enough that it's possible Lohan is just campaigning for any starring role in Batgirl rather than the titular role. Lindsay Lohan did not speak any further about the matter, but her tweet as amassed over 2,200 retweets since she put the message out there. A quick glance at the reactions in her Twitter feed show off a pretty mixed bag of positivity and terrible negativity. Not much has been said about the Batgirl movie since March of 2017 when it was announced that Joss Whedon was attached to the project. A lot has happened in the world of DC since then and it isn't even clear if the project is still in development at this time. Whedon famously took over the Justice League movie from Zack Snyder, which led to some pretty sharp criticism. In addition, the movie is considered to be a commercial bomb by those associated with the movie and had also led to restructuring within Warner Bros. and DC to rethink their strategy from here on out. Warner Bros. just announced that Walter Hamada was stepping in to take charge of DC's movie projects, so hopefully we'll see some kind of forward movement in the next handful of months. There's always the possibility that some of these existing in development projects could be canceled and replaced with other ideas. Depending on the outlook, the Batgirl movie may be less likely to disappear, since it has Joss Whedon attached to it. However, another point of view might place it as not happening for the very same reason. Plus, there have been rumors circulating that Whedon is exiting the project. With over 2,000 retweets, there are some people that would like to see Lindsay Lohan portray Barbara Gordon on the big screen. There have not been any official news updates about the project since early last year, so this project could very much be dead. Maybe Lohan's excitement for the project comes from an insider's perspective that casting is going to be taking place. At this point, it's impossible to tell. 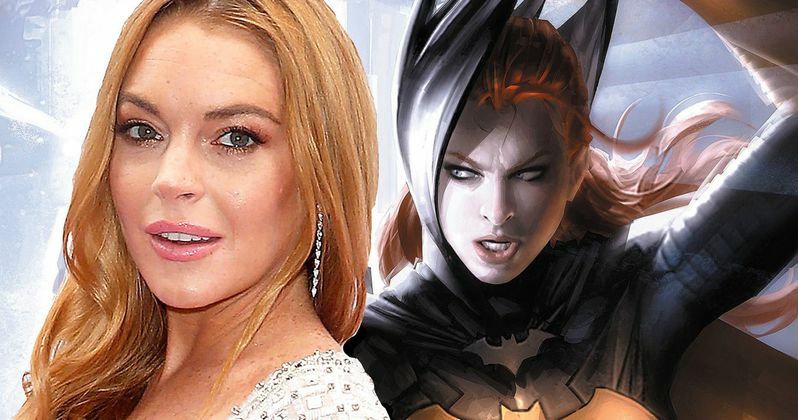 Seeing Lindsay Lohan as Batgirl is pretty unlikely, especially given that director Joss Whedon has said that he wants to use an unknown actress for the role. You can read more about the campaigning for the next Batgirl via below, courtesy of Lindsay Lohan's Twitter account.